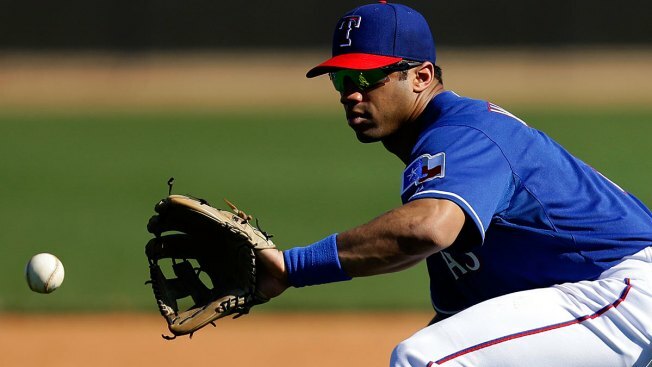 Russell Wilson showed up at Rangers training camp over the weekend in Surprise, Arizona, reprising his role from last year as the one-day celebrity visitor who also happens to be property of the Rangers and a former minor-league player himself in the Rockies organization. Wilson showed up last spring, months after winning the Super Bowl as the quarterback of the Seahawks, and talked to minor-leaguers while also taking infield with Ron Washington at second base, where he played in the Rockies organization. Over the weekend, he returned and did more than he ever did last season. Wilson again took infield with the Rangers, but he also stepped in the batter's box, which he didn't do in 2014. He didn't just take cuts, he also hit a home run in batting practice. Wilson told the Associated Press he believes he is a better baseball player than football player, which is obviously false for the two-time defending NFC champion quarterback, but he has made it known he hasn't ruled out the idea of ever playing pro baseball.